Displaying the outdoors can be a challenge for many homeowners. 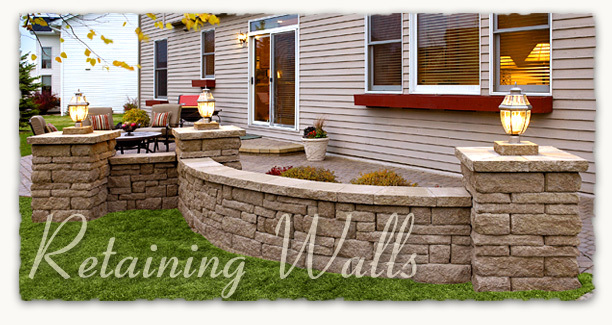 A simple solution is the installation of a retaining wall. A colorful garden highlighted by natural stone creates a viaually appealing landscape design. Our design experts can assist you in bringing the outdoors to a scene of beauty. We carry a wide variety of brick and stone to ensure your outdoor vision is a success. Retaining wall blocks can also be used for creating custom bench style seating or decorative planters that can be integrated into your current hardscape or landscape design. Outdoor lighting can be built into most retaining wall column kits for enjoying your hardscape at night.